Among the many places to visit in Cancun, some really stand out from others because of the experience they offer to tourists. This is the reason why we share with you today 4 things you must do on your next vacation in Cancun. The Mexican Caribbean is a destination full of touristic places, which complicates one’s decision of what to do in Cancun, that’s why we bring to you some options that will make your decision so much easier. Maroma beach: some referrals in international tourism consider Maroma beach to be one of the most beautiful beaches in the world, on top of this it has Latin America’s only hotel above the sea. You have to go there, and its only 40 minutes away from Cancun! Playa Akumal: Akumal means “turtle land” in Mayan language, and it’s a fact, you can encounter some during your visit. Is a beach beatiful at first sight and there you can rest quite. It is just 1 hour and 20 minutes away from Cancun. Bacalar: this is the only “magic town” in the Mexican Caribbean. It is famous because it has a lagoon of 7 different colors where you can swim, travel by boat or practice snorkeling and diving. It is 4 hours away from Cancun and it is definitely worth renting a car and going to this magical place for a day. Snorkeling and diving: did you know that there is a snorkeling tour in Xcaret? Enjoy the natural treasures of this park and observe the best of the ocean. In Xcaret there is also a new system called Snuba which combines snorkeling and diving in one, you have to try it! 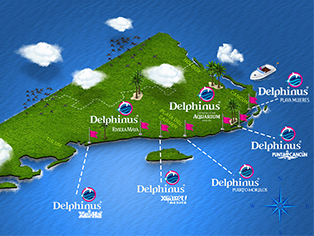 Swim with dolphins: there isn’t any other experience comparable to this one, to live an unforgettable swim with dolphins experience is possible in one of the best natural habitats in Cancun, a must. The magic that surrounds the Riviera Maya is the history and vestiges that the Mayan culture left in this area. Among the Mayan ruins, there are a few that we highly recommend you go to: Tulum, Cobá and without a doubt Chichen Itzá, an archaeological zone that, in its time, was the main capital of the Mayan culture. Perhaps, in your research of things to do in Cancun, you didn’t consider visiting a museum, however there are 3 places that will complement your vacations. To learn more about the Mayan culture we recommend that you visit the Mayan Museum of Cancun where you will find the most important archaeological collection of this culture in the country. Can you imagine a museum under the sea? This is another place to visit in Cancun, we are talking about the Subaquatic Art Museum. And speaking of which, we suggest that you visit the Interactive Aquarium Cancun, where you can learn about hundreds of species, and also live a unique swim with dolphins experience. We really hope that these options help you better plan your vacations, keep them in mind when considering what to do in Cancun and you will undoubtedly build unforgettable memories of the Mexican Caribbean.